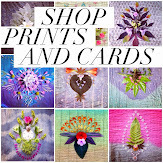 Faith Evans-Sills: Felting like crazy! The Felt-a-Licious class started a few days ago and even with getting ready for my show, I am loving finding the time for this total immersion in the felting world. I didn't anticipate how much Jasper and Carys would also love felting with me but we have been having a ball. I wanted to show you a few of the things that we have made so far. 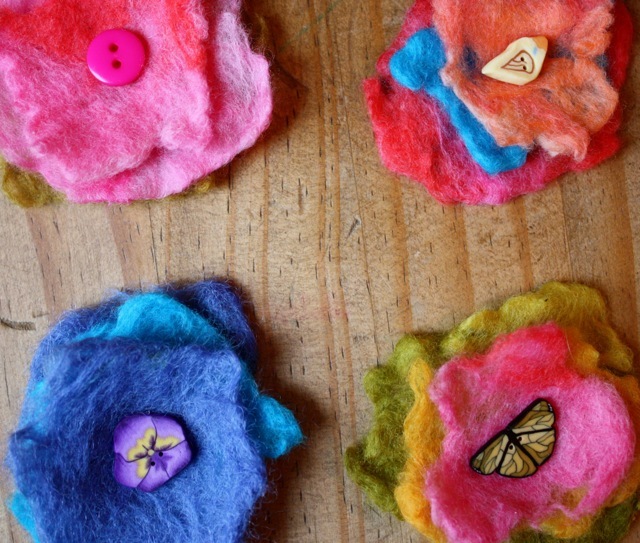 First we made the wool felted petals of the flowers above, that we placed on top of each other and picked just the right buttons from our button collection to decorate each one. 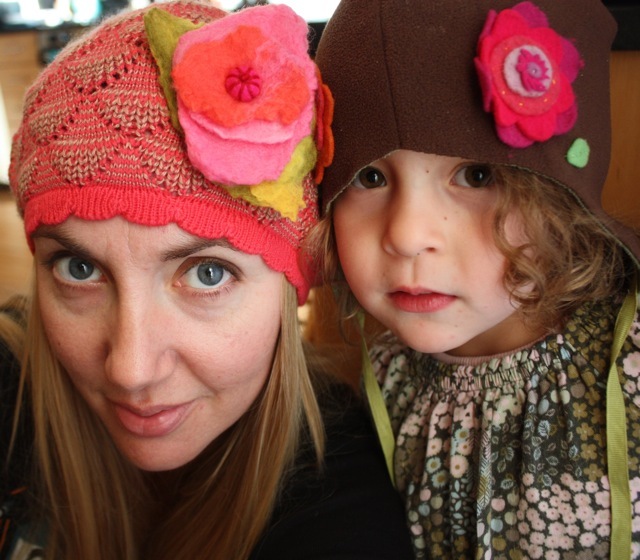 Then I decided that one of the felted flowers from that project would be perfect to decorate the new winter hat that I just bought at H&M, so I sewed it on, and then realized that it looks so cute with the hat that I decorated with felt flowers for Carys last year. Now we can wear them together, I just love how they sort of match! 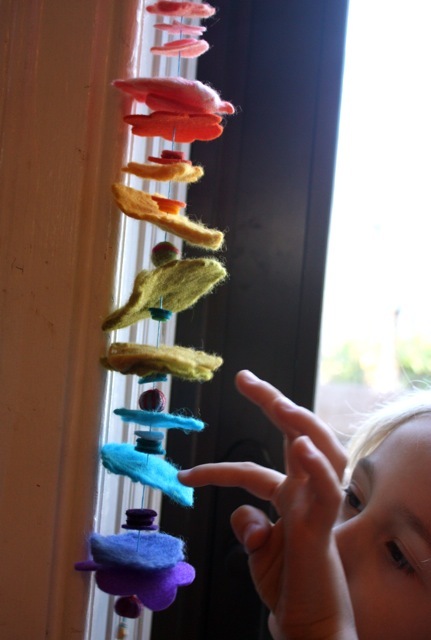 We still had some felted petals left over and the kids and I started making a mobile with them, which then evolved into this hanging rainbow garland.. In between our wool felted petals we strung some beads and felt cut-out shapes. 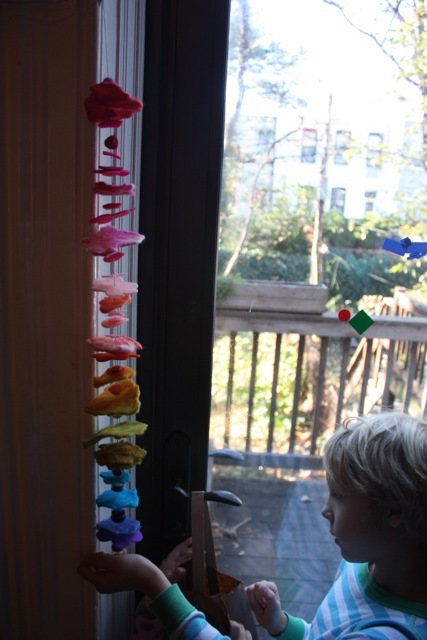 We hung it up by our back door, and the kids love seeing the petals that they felted hanging there in our rainbow. I really love family art projects like this, and am looking forward to more felting to come! Oh are you putting the flowers and garland in your shop? please? The felt flowers are beautiful and I just love how they add to the hats! Beautiful Faith, love the rainbow flowers! I started making flowers after I finished the little Girl and the toadstool...but broke my (Kristin's) needle..so was stopped in my felting tracks...which was a shame because I really felt like making them! Ha ha! 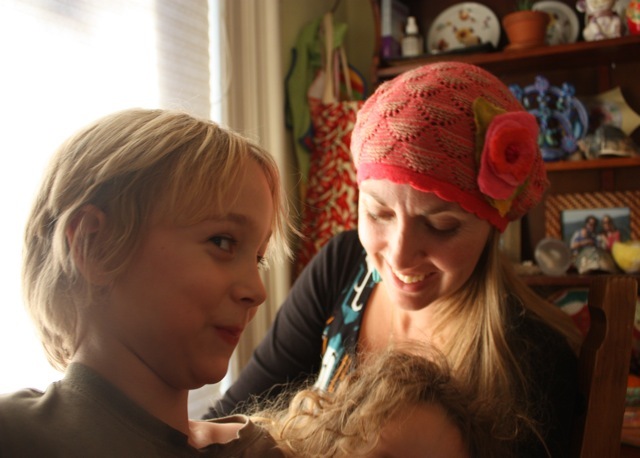 Must get some more needles..hoping to finish the flowers for headbands for the Girls for Christmas. Have fun at the show opening tonight, I will be thinking of you! I love the petal mobile- it's beautiful. i've been on a knitting craze for several months and have neglected my felting projects. I'm looking forward to getting back into it this winter.